The Anadarko Basin granite wash play has been considered difficult to interpret both geologically and geophysically. Consequently, the application of seismic attribute analysis to mid-continent washes has not been widely published. SM Energy’s mid-continent granite wash asset covered a portion of a prolific Missourian age wash trend. In 2010, a competitor drilled a successful horizontal well, Well #1, in the interval with excellent initial production rates (figure 1). Adequate well control existed to generally map the trend across the acreage – however, some uncertainty remained regarding the extent of the sand trend in areas that lacked well control. In order to gain insight into these areas, a seismic attribute study was conducted over a 14-square-mile portion of SM Energy’s 3-D seismic holdings. The mature, oil and gas-producing Anadarko Basin granite wash play is a series of stacked fanglomerate reservoirs with sands of varying mineralogies derived from the erosion of the Wichita-Amarillo Mountain Front. The reservoir, which is the focus for this study, is a Missourian age wash.
Petrophysical properties from local well control suggest that the reservoir sand in the study area consists of a more traditional mineralogical makeup (quartz and carbonate) rather than the feldspar rich, arkosic sands which exist in a deeper portion of the play. For the purpose of this study, low acoustic impedance and low gamma ray are assumed to indicate clean, porous sand within the reservoir. Thicknesses of the sand trend range from seven feet at its thinnest recorded location to over 90 feet in the heart of the trend. Average porosities of the target sand (estimated from neutron/density porosity logs) are 10-12 percent. Generate post-stack seismic attributes from 3-D seismic. Interpret top and base of target, tied by synthetic seismic traces. Build strata-grid from interpreted time horizons conformable to the target area and extract each attribute to the strata-grid. Upscale well logs similar to the seismic scale. Correlate attributes to upscaled well logs to find those with a statistically significant correlation. Apply neural network prediction to combine the statistically significant attributes and generate a predicted property grid representing the property of the correlated log. Use cross-plots and define the target sand. Generate geobodies to compare seismically derived sand thickness estimation to well logs. 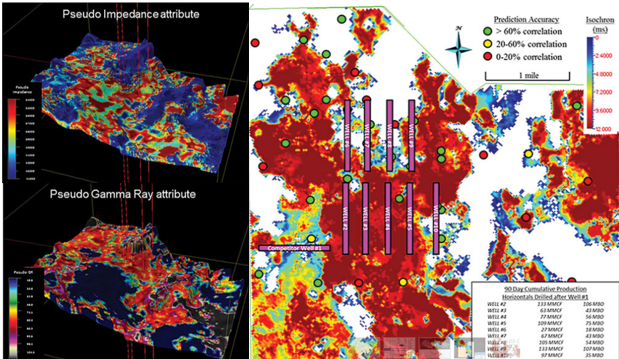 Visually compare morphology of geobodies to well log derived sand thickness map.